Thursday Afternoon and Evening Optional and an additional $60. 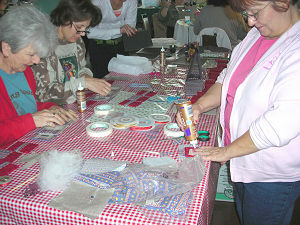 We host delightfully fun spring and fall stitching weekends every year! 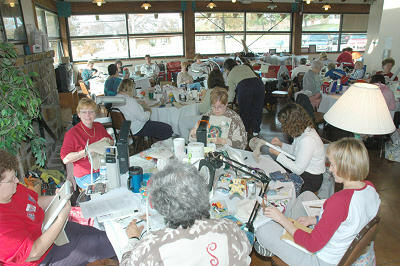 Strictly a fun-get-away type of thing... it's a chance for you to get together with stitching friends or relatives, and relax! Our facility at Oklahoma's Sequoyah State Park... approx 45 minutes east of Tulsa, is wonderfully comfortable, and private for our weekends. Come with a stash of your own projects, be treated to more of ours, and just spend your time doing what you love best -- STITCHING!!! Your Camp Wannasew Weekend begins whenever you're ready! Technically, we don't officially begin till about 3 on Friday afternoon, but we offer an optional extra-night stay for the early-birds, that has grown into quite the popular event!!! Ladies now start arriving in Tulsa (Wednesday night sometimes!!!) Thursday during the day. The shop is open till 6pm... and we generally see 3/4 of the Campers shopping that day!!! 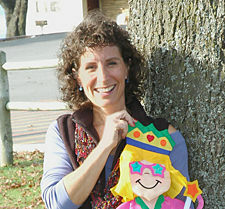 Janice -- the gal in charge on Thursday -- is out at The Bunkhouse beginning at 3 on Thursday. You're on your own for meals Thursday evening and Friday for breakfast and lunch. The park has a full service restaurant, though, so no need to bring anything to cook! The rest of the Silver Needle Gals, the Massage Therapist, and the Weekend's projects arrive by 3 on Friday. Friday evening, we travel down the road a bit to a local Amish farm for a home-cooked meal, and a chance to buy fresh cinnamon rolls, home-made noodles, jellies, cheese... apple butter... yum, yum! Edna has been cooking for our group for 15 or 16 years now... and now her Daughter Rachel... and it's always a weekend highlight! Back at the Bunkhouse for a project Friday night, some door-prizes, and lots of great company. There are always some that go to bed by 10 or 11... but most burn the night oil... and some even stay up all night stitching! Our Bunkhouse facility has bedrooms that sleep either 4 or 6 ladies. There are two main bathrooms shared by the rooms. The 'Quad Rooms' have two double beds. The 6-Stitcher rooms feature two sets of beds and a double. When you register, we keep track of who you're coming with, so that we can fit your group together in which ever room suits you best. (Campers coming alone will always be in single beds!) Our Bunkhouse has a complete kitchen, so there's plenty of room to store your snacks and drinks in the fridge or freezer, if you need to. 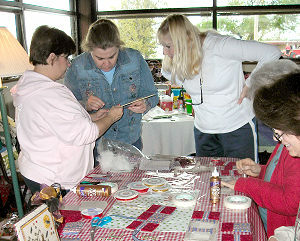 We bring out tubs and tubs of cool needlework merchandise from the shop to display and sell all weekend long. Our miniature Silver Needle never closes during the weekend! All you have to do is stitch, shop, eat, shop, and sleep!!! We check out all the shoppers Sunday morning after breakfast, but before check-out time of noon. Then... you're on your way back to the airport, or Interstate for the trip home. Plenty of time to get home to rest up from the restful weekend!!! 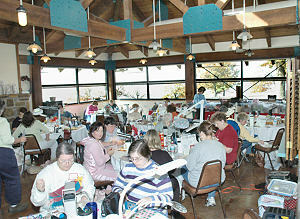 Camp Wannasew Weekend Fee is $250.00. It includes wonderful food -- the Amish dinner, and Saturday and Sunday meals, awesome projects, and your room. All you add are your stitching fingers and cheerful smile! Janice, Mona and I will take care of everything else for you! We've been hosting Camp Wannasew for over 30 years, now... and have so many, many wonderful, fond memories of people, their stories, and treasure so many friendships! Registrations take place in June-ish for the Fall Weekends, and September-ish for the Spring! Registration dates are announced in our monthly e-mail newsletter, and posted at the top this page, as soon as we know them. We require a $125 deposit upon registration, with the balance due 30 days before each Camp weekend. Thursday evening is $60 additional, and can be paid with the balance. I hope this has been a fun bit of info about Camp Wannasew for you! See you at Camp SOON!! !